originally published in amirisu winter 2017, issue 12. now available directly from the designer. 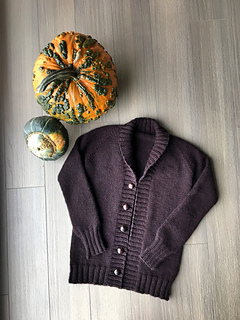 A relaxed cardigan knit with worsted weight yarn. The warmth and the color of the cardigan remind me of the snow skies during winter months, which we often get here in the Canadian prairies. They are the perfect days for staying curled up with a hot drink and cozy oversized cardigan. The deep pockets let you shove your hands and an extra kleenex or two into them. 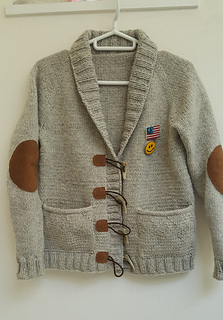 Make it your own by using unique buttons, or fun fabric scraps for optional elbow patches. Finished chest measurements: XS (S, M, L, XL, XXL) = 34 (38, 42, 46, 50, 54)” / 86.5 (96.5, 106.5, 117, 127, 137) cm The sample was knit in size S with 51⁄4” / 13.5 cm positive ease. 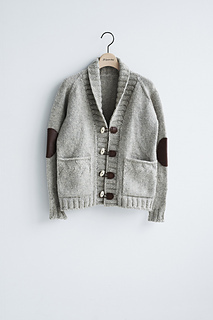 Cardigan is knit from top-down with seamless raglan shaping. Sleeves are picked up after the body is knit and are knit in the round. Collar band is picked up all the way around and worked after body and sleeves are completed, with optional buttonholes worked in on one side. 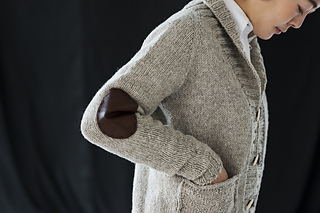 Afterthought patch pockets with a chevron top edge and I-cord bind off add a modern twist, and leather elbow patches are sewn on at the end by hand. モデルは S サイズを着用し , 余裕として +13.5 cm. カーディガンは綴じはぎのないラグランでネックから下 に向かって編む . 袖は身頃を編み終えた後に身頃から目 を拾い、輪で編む . 襟 , 前立ては , 身頃と袖を編み終えた 後で , 身頃 , 襟ぐりから目を拾い編んでいく , トグルボタ ンを使わない場合は片側に好みでボタン穴をつける . 最 後にオプションで手縫いで革の肘当てを縫い付ける .